Who should take the Emergency Oxygen Provider course? Knowing how and when to use emergency ox ygen is a great skill to have and means you’re ready to help others should the need arise. Becoming a PADI Emergency Oxygen Provider lets you breathe easy knowing that you can recognize scuba diving illnesses treatable with emergency oxygen, and are prepared to offer aid. Anyway, the PADI Emergency Oxygen Provider is a perfect supplement to the Emergency First Response (EFR) Course respective the PADI Rescue Diver Course and is highly recommended for divers who plans to work as a professional PADI Divemaster! 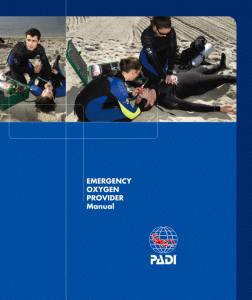 Contact us at Arizona Dive Shop Subic Bay to enroll in the course and get your PADI Emergency Oxygen Provider Manual. Read the manual before class as directed by your instructor in preparation for skill practice. We at Arizona Dive Shop Subic Bay have emergency oxygen units available to use for training and we can help you to purchase your own unit for use after the class. You’ll also need to have a disposable non-rebreather mask to use during practice sessions, which your instructor can help to provide.